Greatest Super Regional ever? Quite possibly. All three games came down to the wire, with Mississippi State walking off game 1, Vanderbilt walking off game 2, and Mississippi State winning game 3 in eleven innings to advance to the College World Series for the first time since 2013. As far as uniforms go, Mississippi State wore the same uniform rotation it wore for its last 3 road SEC series, so pretty straight forward, right? Maybe, but we'll still go in-depth. Even though it's been "normal" for both teams this season, Sunday's uniform matchup was almost certainly the most confusing in super regional history. How confusing? Well, it ended with the team wearing black dog-piling at Vanderbilt's stadium. So that confusing. The series started on Friday night. Mississippi State won the coin toss to be the home team in game 1, which of course meant that they had the very important advantage of batting last, but actually didn't affect the uniform matchup for game 1 at all. As they have every single Friday all season, Mississippi State wore Maroon 85 over White; Vanderbilt, despite being the "away" team, wore white uniforms anyway. So the uniform matchup would've been exactly the same had home/away been reversed. Mississippi State got the win off of another walk off home run by Elijah MacNamee; it was the Bulldogs' first win in the Maroon 85s this postseason. On Saturday night, the home/away designations were reversed; Vandy was the "home" team while State was the "away" team. This time it did affect the uniform matchup; as the "away" team, State wore gray pinstripes, whereas they probably would've worn white pinstripes as the "home" team. Vanderbilt wore gold jerseys over white pants; like white vs maroon the night before, the gold vs gray uniform matchup was pretty nice. The game, however, did not have a nice ending, as Vanderbilt walked off to even up the series and force a game 3. Game 3, as mentioned earlier, featured what was probably the most confusing uniform matchup in super regional history. Vanderbilt, whose school colors are black and gold, wore navy "USA" theme jerseys and hats with white and red accents; it's a tradition that Vanderbilt has done on Sundays at home for the past several years. Mississippi State took the opportunity to fill the void created by Vanderbilt *not* wearing black, and ditched its own school colors of maroon and white to don the all black 85 look, which they have done every Sunday since the Ole Miss series. So, while both were looks that the respective teams have been wearing on Sundays this season, the combination of them both being worn on game 3 of a super regional created the ultimate "what is going on here?" moment that made people who never pay attention to uniforms stop and look for a minute. The game itself was nerve-racking. I'm sure from a neutral perspective it was great, but as a Mississippi State fan, you weren't able to relax until the final out was recorded in the bottom of the 11th. When that out was finally recorded and the Bulldogs had won 10-6, they dog-piled on Vanderbilt's field wearing Vanderbilt's primary color. Bananas. With the win on Sunday, the Bulldogs became 8-2 in the all black uniform combination, one that has been so polarizing among the fanbase. I said from the start that the design of the uniform was by far the best that we have had for a black uniform; the 85 design is one of the best in college baseball, it just happens to be in the wrong color here. Many complain about the lack of maroon on the uniform, but honestly I can live it with; maroon and black don't go well together, so if we do black it does look better if maroon isn't included. It just has the unfortunate side-effect of including 0 school colors. Overall, it has grown on me a bit due to all of the winning; black pants are still not ideal in baseball (unless you look at it in a super-throwback type of way, which I'm starting to) and white pants would look way better, but we win in these things. The "NickelBlack" uniforms. 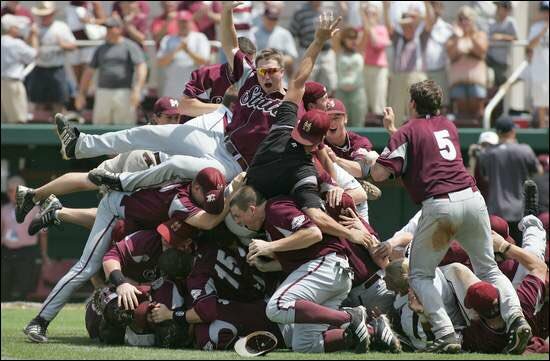 If you're like me and you don't love the all-black 85s, keep in mind that they are not the worst uniforms Mississippi State has ever dog-piled for Omaha in. That would be 2007. 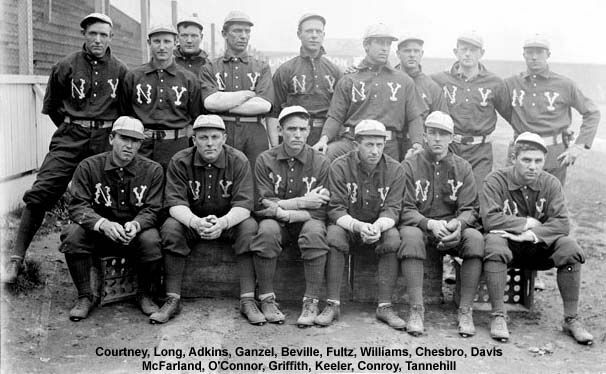 The notion that the all-Black 85s are are most successful uniform is indeed correct; they have an impressive 8-2 record. However, don't forget about the White "State" Pins, which have a 7-2 record, including the iconic walk-off over Florida State. One win in them in Omaha, and the White Pins are just as successful as all-black. Mississippi State is headed to Omaha for the first time since 2013! I've been making what I call "CWS Roundels" every year since then, and I was pumped to be able to include the Bulldogs again; you can check those out here. Finally, I updated some iPhone wallpapers I made a few years back to include State's 2018 CWS appearance. You can download those here. I plan to do a blog post about the Dawgs uniforms. What's the deal with "NickelBlack"? How did that come backabout and how long have the Dawgs had black uniforms? I can't speak as to how to "Nickelback" nickname came about; the first time I heard that was on the TV broadcast Sunday Night. I can, however, speak to how long they have been worn. As you can see in the season graphic at the bottom of this article, State first wore the "Black 85" uniforms early this season at Texas A&M Corpus Christi (link to that blog post: https://www.hailstateunis.com/2018-baseball-season/first-week-of-road-trip-sees-season-debut-of-gray-pins-black-85s). The black pants and hat were first worn in the second home game of the season, against New Mexico State. (link to that blog post: https://www.hailstateunis.com/2018-baseball-season/mississippi-state-opens-up-new-dude-with-4-win-week).